It’s the most wonderful time of the year … to sing! As a cradle Catholic attending a Lutheran college, I remember visiting the home of one of my Lutheran friends and finding that her family had on their shelf a copy of the “Lutheran Book of Worship.” The idea of having a copy of your church hymnal at home was surprising to me and yet made so much sense. I had a copy of the accompaniment edition of my parish’s music book at home, but that is because I was a regular organist for the parish. As far as I knew, however, no one in my friend’s family led the music at their worship services. Having the hymnal in one’s home was also for the people in the pew. If the Sunday Mass is the source and summit of our Christian lives, why should we not consider bringing some of that music home and singing hymns of praise to our God in settings other than church? One might argue that it is easier to do this with the “Lutheran Book of Worship” than it is with most Catholic hymnals because the former has the harmony parts, which makes it much more enjoyable to play on a piano. That is certainly true. But even though it is more difficult to buy a “home” version of our parish music book, there are other things we can do to build up a culture of religious singing among our families and friends. And Advent and Christmas may be the best time of year to start. Think of a few of your favorite Advent and Christmas hymns: perhaps “O Come, O Come, Emmanuel” or “Silent Night” or “Joy to the World” come to mind. 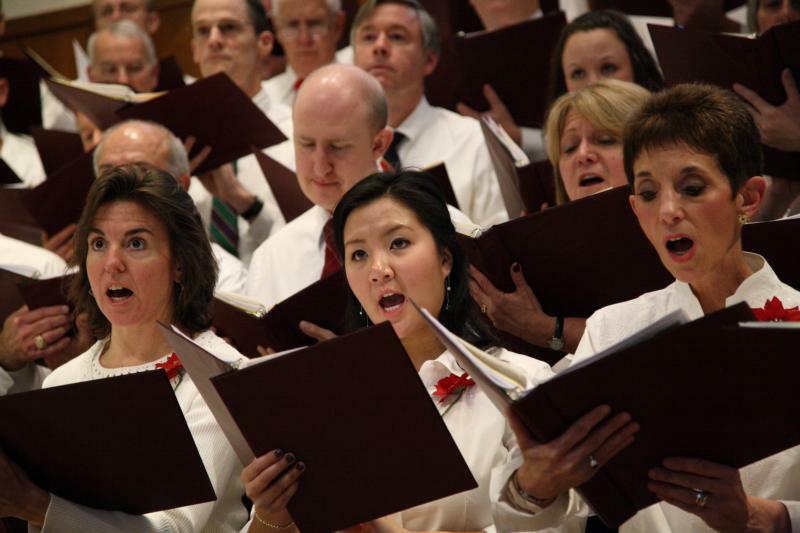 You can almost certainly sing the melody of these or other familiar hymns and carols. The next step is to think of times when you could sing these with your families and friends. Some families have particular prayer customs for different seasons, like the lighting of the candles of an Advent wreath. That would be a perfect time to sing a verse of “O Come, O Come, Emmanuel,” to match the lighting of candles with a beautiful chant hymn from our Christian tradition that reminds us how Jesus’ coming fulfills the promises and prophecies made to God’s chosen people. Such a custom could be continued into the Christmas season with a verse of a Christmas carol as you sit around the Christmas tree to open gifts. You could sing a verse each day of the “Twelve Days of Christmas” and finish with “We Three Kings” for Epiphany. Even if it is difficult to get a “home” version of your parish music book, the words to these familiar hymns and carols can be found easily online. You can even find music with the harmony parts if you have a piano or singers who sing in harmony. Pick your favorites, search, print and sing — it can really be that easy! You may have family members who would not, on their own initiative, be inclined to join in. Neither of my extended families had ever sung Christmas carols at our family Christmas celebrations, but I decided to give it a try a few years ago. I brought sheets with the words to familiar Christmas carols, and, because I had gone through the effort, at least a few of my family members were willing to try. Others gradually warmed up to the idea and started to join in. I could tell that they were happy to sing these familiar songs, and a few even expressed their gratitude personally afterward. For many of us, sharing our Catholic faith in our own words can seem difficult or awkward, especially among our families and friends. Singing about our faith can be a beautiful way to overcome that obstacle and, in turn, give us the courage to be bold in sharing the reason for the hope that Christ, the savior of the world, gives to us (1 Pt 3:15). Father Vincent Ferrer Bagan is a Dominican friar of the Province of St. Joseph. He has worked as a school music teacher and church music director and presently teaches theology and music at Providence College in Rhode Island.